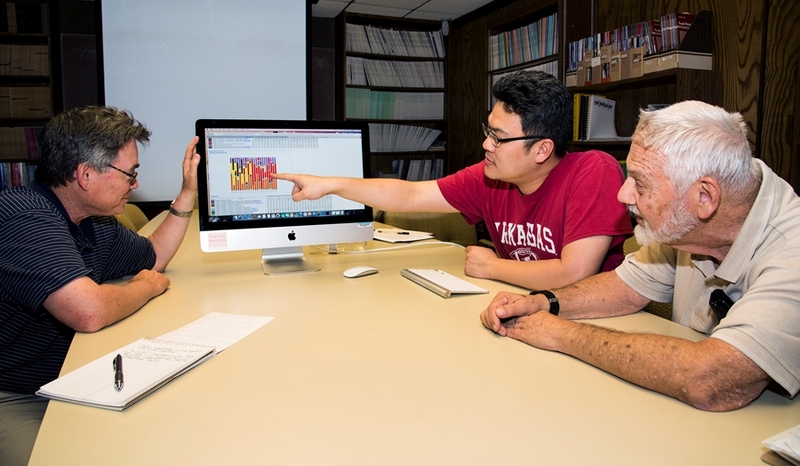 From left, Steven Ricke, director of the University of Arkansas System Division of Agriculture's Center for Food Safety, post doctoral research associate Si Hong Park and David Stock, professor of biology at Stetson University in DeLand, Fla., review gene sequencing data from micro biome research. Park is now an assistant professor of food science and technology at Oregon State University. FAYETTEVILLE, Ark. — Advanced genetic sequencing techniques are imparting better understanding of the bacterial communities residing in animal gastro-intestinal tracts, said Steven Ricke, director of the University of Arkansas System Division of Agriculture's Center for Food Safety. Ricke told a gathering of food scientists in Seoul, South Korea, that the new knowledge coming out of his research could lead to a new model for improved food safety in the poultry industry. Ricke, who is also professor of food science and holder of the Donald Buddy Wray Chair in Food Safety, was the invited plenary speaker at the Korean Food Safety Conference in November. In his talk, "Salmonella Vaccines and the Microbiome in Poultry: A New Food Safety Paradigm," Ricke described how a more complete understanding of microbial communities in poultry could lead to improved prevention of Salmonella contamination in chicken meat. "Salmonella remains a persistent foodborne pathogen that occurs as a contaminant in poultry and meat production systems," Ricke said. Many control measures have been used during processing to limit contamination on poultry carcasses, he said. New measures are being examined to limit foodborne Salmonella colonization in live bird production. Efforts to control the pathogen in poultry flocks includes bacteriophage feed additives that eliminate already colonized Salmonella in the birds. Bacteriophages are viruses that are harmless to chickens and to humans, but that destroy targeted bacterial pathogens by disrupting their reproductive mechanisms. Other products added to poultry feed include probiotics and prebiotics, which prevent Salmonella from colonizing by occupying "real estate" in the guts, thereby crowding out the pathogen before it can establish a population. Salmonella vaccines inhibit establishment of Salmonella, Ricke said, by stimulating the immune system of the bird to more rapidly recognize invading Salmonella and mount a specific immune response that limits its ability to remain in the bird. Ricke leads a team of researchers that uses next generation genetic sequencing to identify microbial communities, or microbiomes, that exist in animal GI tracts, especially those of chickens. These are complex populations of microorganisms — some good, some bad, some indifferent — that share space in the gut. He wants to know what's in there, what they're doing and how they interact. What they're learning, Ricke said, is that there may be a more complex interaction between Salmonella, the intestinal tract and the indigenous microbial community that inhabits that space. Throwing light on those interrelationships, Ricke said, could advance a new approach to constructing more effective strains of Salmonella vaccine.